Way to go, branding! Okay, enough snark for now so that the product at hand may be scrutinized properly. Seen below is the Tether in action. What it does is provide an easy grip for fragile wine glasses. Of course, since the world is in the grip of the holidays, the Tether becomes ever more practical as wine and champagne are served in jolly abundance. At seven inches long, each Tether allows for an easy grip on the stem of a wine or champagne or even cocktail glass. Because nothing is more teeth gnashingly frustrating than wet glasses slipping from your oily fingers while trying to clean them, the Tether arrives right on time. 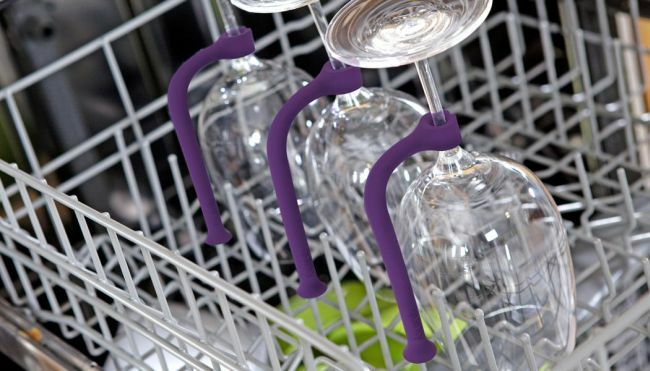 The Tether comes in sets of four and work best when cleaning your wine glasses in a dishwasher.